My great, great grandfather was William (‘Good Old Billy’) Slade, who features in about 14 of the pictures (on pages 11,15,17,18,19,22,23 and 24!). His son was William John Slade, mentioned a couple of times as ‘Young Slade’ and W J Slade. 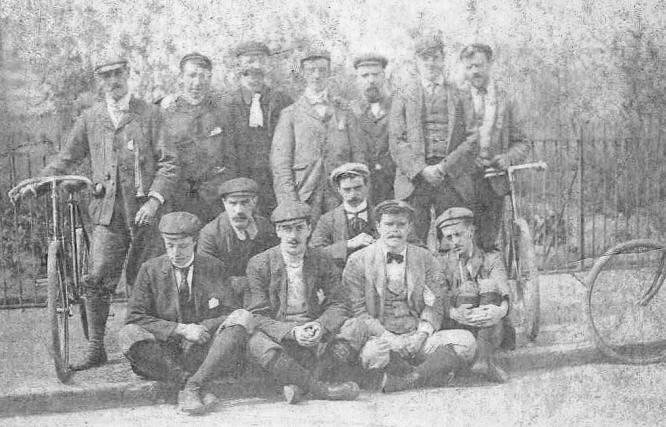 From various photographs, mementoes and medals he won, we knew that William John had cycled competitively and been a cycling club member, but to see William senior fully immersed in the activity too is a delightful revelation. The pictures show our ancestors in a completely new light to the dour expressions we see on the only photos we have of them. I’ve attached a photo of each of them – they look remarkably alike. William senior, born in Somerset in 1839, would have been 48 in 1887, hence ‘old’ to the 25 year old artist and his young companions. His moustache, a fairly life-long characteristic, can clearly be seen in at least a couple of the sketches (page 17). 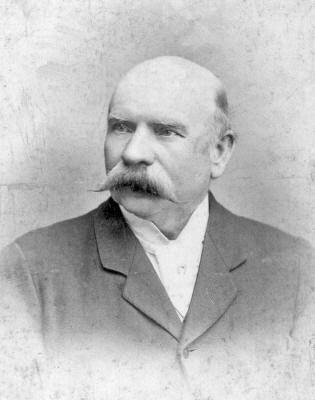 From censuses we know William senior was originally a coach wheeler in 1861 and later a coach builder in 1871, by which time he was in Liverpool, but by 1881 his occupation was bicycle maker, and he was a ‘Cycle factor and agent’ in 1891.
got married in March 1887 (perhaps the reason he wasn’t quite so much involved that year!). He was a ‘bicycle salesman’ all his life and seems to have just lived and breathed cycles. 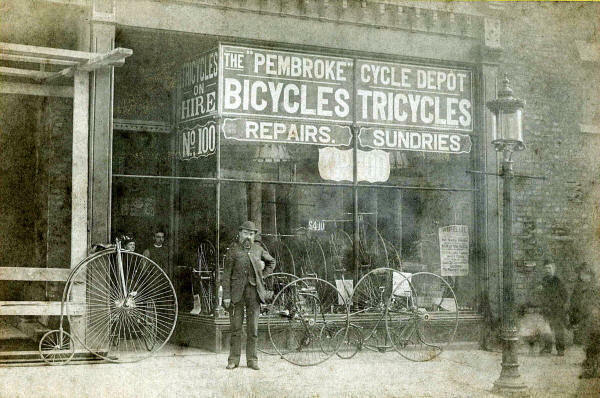 We know they ran several bicycle shops, although we don’t know whether there were more than one at the same time, and we are also not sure if William John broke away and ran his own separately. We have a couple of photos, years apart, but the exact whereabouts of each is difficult to pinpoint. The oldest photograph we have is this one we think of as the ‘Great George Street’ shop. It clearly shows the number 100. From the wording on the shop window, however, it makes more sense to wonder whether perhaps the shop was in Pembroke Road. Gore’s 1880 Directory has ‘William Slade, bicycle maker, 98/99 Prescot Street’ also suggesting a shop there, perhaps even earlier. The Slades’ 1881 census address was 99 Prescot Street and William senior and family lived at 2 Great George Street on the 1891 census. In the doorway of No.100 can be seen (for certain) William John Slade, hair still dark, maybe about 25 (his age in 1887) and his sister Mary Ellen, of whom we have other photos. The identity of the gentleman in the front is unknown. The Penny Farthing and tricycles are very much in keeping with the machines in the sketchbook aren’t they? 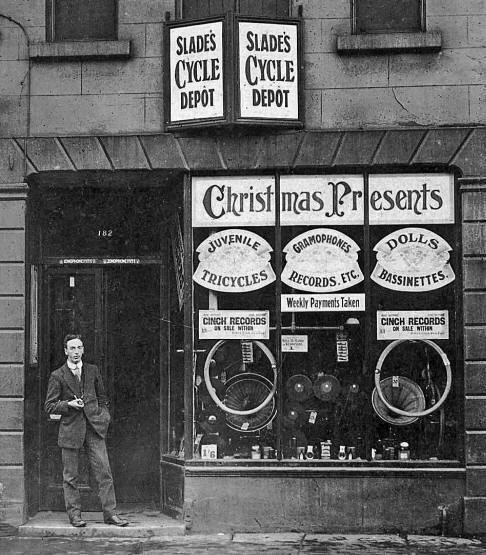 William Slade senior was obviously quite successful making bicycles as by 1901 he had moved to an impressively large house, ‘The Hollies’, 1 Prospect Vale, on the corner of Prescot Road, Fairfield and when he died in 1912 aged 78 he left over £6000. 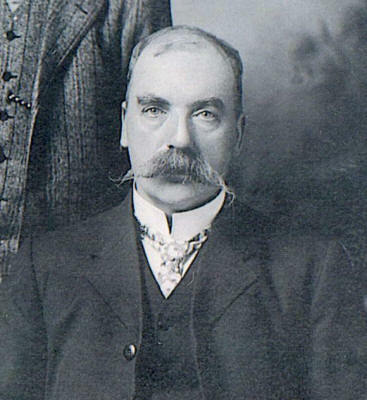 William John died only 3 years later in 1915. This photo is much later and obviously of a much smaller establishment! It has diversified considerably into records, record players and dolls' prams! It has No.182 above the door and we think of this the ‘Fairfield’ shop. It could be on Kensington or Prescot Road. Standing in the doorway is George Slade, William John’s son. Logic says the photo was taken not long after 1913: ‘Cinch Records’ (see the window) were launched in 1913 and ceased production in 1916 (Google) so it cannot be before that. However, the family already lived at another shop at 548 Prescot Road (at the corner of Batley Road) some time before William John died in 1915. 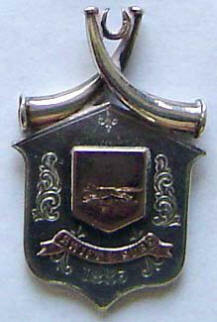 We have a medallion which relates to William senior’s business, and 3 medals relating to William John’s cycling exploits. (Carpenter was William senior’s wife’s maiden name and for a while her brother Thomas Carpenter was in business with William). 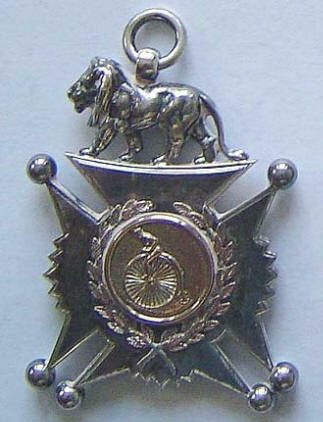 Medals on left and right: both are blank on reverse and show penny farthing on the front. 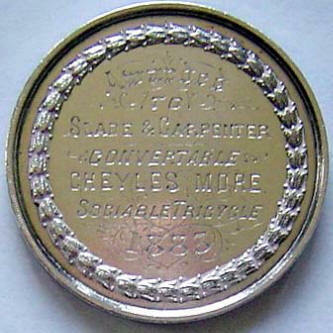 William John also had a habit of bringing back souvenir crested-china from the different places he visited, which included Nottingham, Cambridge, Windermere and even John o’ Groats. A tale passed down the family is told of him riding a penny-farthing from Liverpool to Bristol one weekend to visit his Carpenter grandparents! 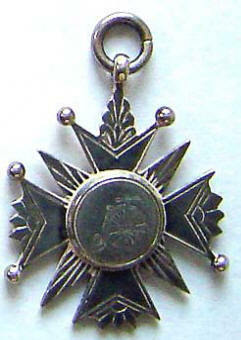 Can anyone shed any light on the medallion and medals, or comment on them? I have no idea how rare or common they might be.